This sequel to the enormous international hit The Gods Must Be Crazy isn't quite as fresh and enchanting as the original, but it is still a garden of small delights. N!Xau, the Kalihari bushman who starred in the first film, is separated from his children while on a hunting expedition in the desert. The emphasis is on the kids, who are kidnaped by elephant poachers. This activity is counterpointed with the adventures of the film's "civilized" characters, transplanted New York attorney Lena Farugia and zoologist Hans Strydom, who find themselves stranded in the desert (their adventures are similar to those experienced by fish-out-of-water Linda Kozlowski in Crocodile Dundee). Meanwhile, a couple of soldiers who've wandered away from a border war devote their time to capturing, and escaping from, each other. As in the first film, the various subplots converge, with N!Xau once more emerging as the hero of the hour. Charming sequel retains madcap whimsy of family classic. ...it's hard not to get a kick out of watching a character battle over a cup of water with a baboon. With any 'strike while the iron's hot' example of sequel moviemaking, you're bound to trudge through a lot of familiarity in order to find the few worthwhile moments. "another sequel nobody needed to make"
Ha Ha. Similar plot to the first, except worse. A goofy foreign film with sped-up action and contrasting dry narration, which makes some laugh. Not me. 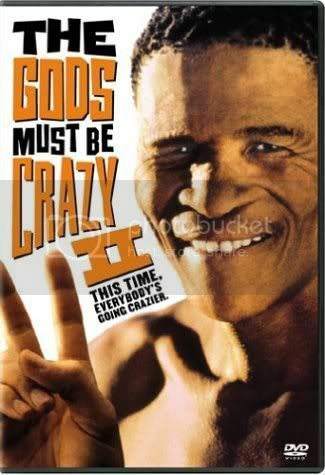 I didn't even know that there was a sequel (poking around on IMDB showed me that there were in fact 5 The Gods Must Be Crazy movies but the last three were made in Hong Kong and were never released in the United States and were pretty horrible). It was even a little better than the first one. Thanks to this movie, I know not to mess with badgers. More funniest than the original. Lots of quick motion scenes.